Our verdict on the latest episodes and products. 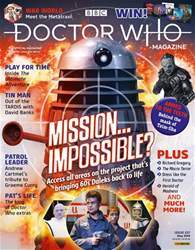 Can it really be 40 years this October since Doctor Who Magazine, then in its more kiddified guise of Doctor Who Weekly, made its debut? Those of us who were just the right age in 1979 devoured that vivacious little comic, poring over its Fact Files, caption competitions and Dalek histories… even that back page advert for Mr Bellamy’s Amazing Liquorice Novelties (only 3p!). There were three comic strips in that first issue: a Doctorless Dalek story (good enough, but hardly proper Doctor Who), a zippy adaptation of HG Wells’ The War of the Worlds (impressive, but, again, where’s the Doctor?) and – most marvellous of all – the first part of Doctor Who and the Iron Legion, a vaulting sci-fiepic that saw Tom Baker’s Doctor caught up in a Roman invasion of an idyllic English village before being whisked off to a parallel Earth where the Roman Empire never fell and where Caesar’s robotic army has enslaved the galaxy.